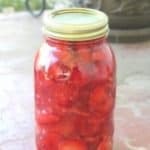 Easy recipe for canning strawberry pie filling. Measure the strawberries after you have sliced them. This inexpensive strawberry slicer works great for slicing a lot of strawberries in a hurry and they are perfectly sliced every time. In a large stock pot, stir together the Clear Jel and sugar. Add water. Cook on medium heat until mixture just begins to thicken. Add lemon juice and stir. The mixture will thicken very quickly, so don't walk away from the pan, and remove the pan from the heat as soon as it thickens. If you find that your mixture thickened too much, you can add a little water to get the desired consistency. Fill your sterilized quart canning jars, leaving 1 1/2 inch head space. This inexpensive canning funnel easily measures the head space for you. It is very important in this recipe to leave enough head space. The Clear Jel causes the mixture to continue to expand during the canning process, and if you don't leave enough head space, you will end up with a mess on your hands. Wipe the rims of the jars with a damp paper towel or dish towel and place the sterilized lids and rings on the jars. Place the jars in your boiling water canner. Make sure there is at least 1 inch of water covering the jars. Bring the water to a boil and boil for 30 minutes. Remove jars from canner and let cool on a dish towel on the kitchen counter. Sealed jars can be stored in the pantry for 1-2 years. If you have any jars that didn't seal, place them in the refrigerator to eat within the next week.